When I started the blog I debated what would make for a good blog name. One of the names considered was “Extreme Early Retirement” but I found that that name had already been “parked”. Early Retirement Extreme was free though and ERE also made for a better acronym than EER. In retrospect, here slightly more than 3 years after starting the blog, the R-part of that name has turned out take have some annoying side-effects. I found the crux of the matter to be that people have different and preconceived notions about what retirement means. Retirement has traditionally meant the part of life that followed a life-time of work. Retirement was for those workers who were broken down physically and sometimes mentally and unable to work further. The way industry had been set up meant that they could be replaced by a younger functional version much like a part in a machine. As a more robust financial system replacement family dependence of having children, some people who managed to accumulate enough capital became able to retire a few years earlier than usual. A person could stop working even while being capable of continuing work. This was the first paradigm shift. Traditionally households had a single income which meant that there were enough savings to support the household. Recently, the idea of retirement has begun to change. First, as households became poorer in real terms, single income households turned into dual income households. This now means that one person can retire while the other keeps working. This is the second paradigm shift. Here one person could retire several or even many years before the other. Some people have also been able to push the age of retiring, that is, the age of no longer working for money far down. This is called extreme early retirement. This is somewhat different from using up one’s money until the pension rolls in. This is more akin to a lifetime of cash flows from investments that are not drawn down in value. This is what I am talking on on this blog. This is the third paradigm shift. We have come pretty far away from the original definition of retirement: from someone who is too worn out to work to someone who has enough money so as not to need to work. This is why early retirement extreme is a bad name. Maybe financial independence extreme would be a better name? Well, here the problem is that financial independence also has come to have many different meanings. For me it means having enough savings to pay for (finance so to speak) all my needs over a lifetime. Yet, for some it simply means not having any debt; for others it means having enough income to pretty much purchase whatever they want. These definitions are even further removed from what I intend. Another suggestion is “Independently Wealthy”. This is actually pretty accurate, except many people confuse “wealthy” (having money) with “rich” (spending money). 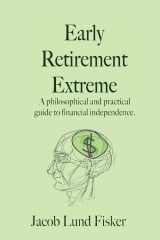 20 users responded in " Why Early Retirement Extreme is a bad name "
In my opinion, “financial independence” can be reasonably defined as “freedom from the necessity of paid work.” This is different from what people typically consider to be “retired,” because “retired” people generally stop working. However, financially independent people need not stop working if they find “work” that they enjoy. I think that this is the conundrum that you face with your blog name, but it’s not worth worrying about. In fact, from a marketing perspective, it might be an advantage, since I would guess that more people search for retirement than they do for financial independence. However, I could be wrong. Anyway, I’m impressed with what you have been able to accomplish. Although I live below my means and have zero debt, which is rare these days, I personally have struggled with the idea of living like you do. Although I’m not extravagant, your way of living does seem “extreme” to me. A lot of the things that you do to save money seem like “work” to me, so in many ways, I kind of don’t see the point of being so extremely frugal. I guess we all have to find our own path though. Well, I think it’s all relative and up for personal interpretation anyway. At 51, I’m a little old for extreme anything, and have a ways to go before I can quit working (this said while being unemployed for over a year, which should not be confused with retirement or being of independent means. My husband is six years my junior, but I want him to be able to retire with me, and not keep having to work, so if I manage to be able to retire at 59, he would be retiring early. At this writing, it’s doubtful, but the first thing we’re working on is paying off the house (we have no other debt, thank goodness). I’m not sure that early retirement is what we’re aiming for, but definitely we would like to be ‘of independent means’. Whatever works. I’m going to have the same problem with my blog too. Like Paula, I am in my 50s so my hope is to retire on time. Using Extreme Measures to Ensure Retirement On Time is rather long for a blog title though, so I think ERE is fine. I still like the name! I grew up within a great network marketing community. I knew quite a few people that had built up enough residual income to be “retired” at 30 years of age! They didn’t really have to work, yet the money kept coming in – I would call that “retired” in my book. “Financial independance” always reminds me of irritating landing pages. I like “Extremely early retirement”, but I’m no native English speakers so I’m unsure how that sounds to others. Indeed my friend, there are many perceptions out there! I understand what your blog is all about though. Just after a couple of readings, we get your point (at least I do!). Still, I admit is must not be that simple to everyone. Maybe a better idea would be keeping your name but adding a short elevator pitch as a “subtitle” to your website and that describes your meaning of this title (instead of “written by Jacob…” something like “a lifetime of cash flows from investments” that you wrote in this post). Jacob,I like “Early Retirement Extreme”. I think most of us that read your blog regularly get the point you are making. No matter what you call your blog, it will always be up for interpretation. Therefore I think you should leave it as is. I also like ERE over EER. However, I really like FUME, because it has a good acronym, avoids the cliche landing-page sound of “financial independence” and also avoids the preconceptions about “retirement”. The only downside is people with delicate sensibilities who would never tell anyone “FU”. For those who are not on the forums, FUME stands for F@ck You/U Money Extreme. I like it the way it is…if people complain and say its too extreme refer them to the….title of the blog. Duh. There is something powerful about the word “Retirement” that does not exist in “Financial Independence”. I’m no linguistics expert, but the image of retiring to me is one of action, making a change, leaving something else behind, making choices, moving on to something else (better). Your blog to me is, more than anything else, about making the (extremely) tough choices, choosing (extreme) actions, more than just a description of a state one is in. Unfortunately the definition of many things is changing right now and retirement is surely one of those areas. Seriously, what do names matter? Recently received ERE book from my good friend for my B’day. Just starting to read…. Should’ve just named it FREEEEEEDOOOOM!!! The name ERE quickly meant nothing to me.Like pressing the number 2 on my phone no longer means a phone number, it only means I want to talk to my wife. Clicking on the ERE bookmark doesn’t mean Early Retirement Extreme, it means I want to access great ideas. When we are born, we are brought up by our parents to learn things and be responsible for things at various stages of our lives.. when we are pre 1-2 we learn how to walk, we learn how to eat.. as we get older we learn how to put our toys away, then go to school… learn responsibility and consistency to follow through. As we move towards young adult or teenage years, we learn to drive, learn to date, have a job and in some cases learn to be responsible with money… If the person continues growing, they may consider college – then ultimately at a job.. If we are taught the responsibility of money , the joy of actually “living” (effective living)and not buying/mortgaging your life – it’s not uncommon for people to become independent somewhere between 30-45. Thus moving on to the ‘next’ stage of your life… the freedom to choose and do what you love. this is an uncharted, un-understood area of life where few people have tread. US being responsible and moving through the stages of life, give room for the next generation… and being responsible also helps your families future generations (generational wealth), but that’s a whole other blog idea. We can actually ‘change the world’ if we look beyond our current generation..
Anyway… random thought is over. Please feel free to comment for clarification.